We started our morning off right-- with an ice cream sundae party! 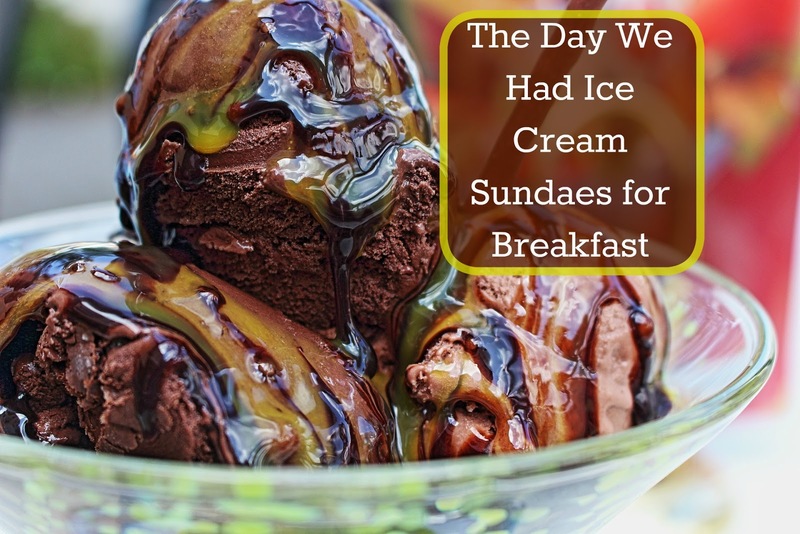 My kids were thrilled to know what we were celebrating their accomplishments and hard work today; the older two boys had memorized all of their multiplication facts and I had promised them an ice cream sundae party. I think our celebration was made all the more special because we had our ice cream for breakfast! In our house this is pretty huge and shows all of MY growth since starting homeschooling. I used to be a "rule" person; our house was shrouded in rules (and we still have quite a few) but I've learned to loosen up some and I find these unexpected times I announce things like "who wants an ice cream sundae for breakfast?" make for the best memories. The boys were beside themselves laughing, talking and piling toppings onto their creations. Other than scooping the ice cream for them they wanted no help in making their sundaes. They each had quite the towering pile of sweets by the time they finished putting them together and we had quite a few messes on the table and floor but it's all part of the fun and the process. I grabbed the camera and just snapped away. Evan loves sprinkles and Oreos! Ian has a waffle bowl and a cone! While they dug into their sundaes (and as I was eating mine) I read some more of our Harry Potter book. It was the perfect start to a wonderful and relaxing day!